Hello! I`m Mamie, the blue budgie in the back left corner of this photo. Along with the other two blue budgie hens pictured here, I was named after a great blues singer. 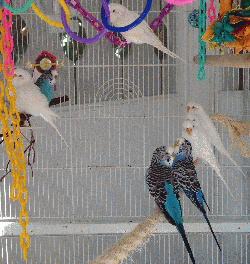 All of the budgies I`m pictured with here are related...perhaps sisters or cousins, but we`re not saying. We aren`t very tame right now, but we could certainly learn to be: budgies are friendly and smart, and we get brave when someone offers us a treat on an outstretched hand! We like to eat Nutri-An cakes and leafy green vegetables. We are still reluctant to eat orange veggies, but our foster mom is trying to persuade us to try them, because they are a good source of Vitamin A.